The words of the Prime Minister of Poland that among the collaborators helping the Nazis during the Second World War were representatives of different nationalities, including Jews, have been confirmed by historical facts, the chief of the Polish Prime Minister's Chancellery Michal Dworczyk said on Polish television. "Of course, the Prime Minister said that there were perpetrators both among the Polish people and among other nationalities who were living in Poland at that time, among Jewish people also, and this is a painful truth. Discussion on this topic is continuing in Israel and incites deep emotions," Michal Dworczyk said on Polish television. "For all the PMM attackers (premier Mateusz Morawiecki) — less hysteria, more facts!" wrote the chief of the Polish Prime Minister's Chancellery Michal Dworczyk on Twitter. A photo added to the post illustrates excerpts from The Warsaw Ghetto: A Guide to the Perished City by Barbara Engelking and Jacek Leociak saying, that in the Warsaw ghetto there were people who collaborated with the Nazis. Some of them did this, believing that the Nazis would win the war for the sake of the future of the Jews (both individual and collective). Others cooperated for money and improved living conditions, from opportunism, fear and, finally, to protect themselves and their families. Not all charges of cooperation (also discarded after the war) were supported by indisputable evidence; the harder it is to check them today. — Michał Dworczyk (@michaldworczyk) 18 февраля 2018 г. 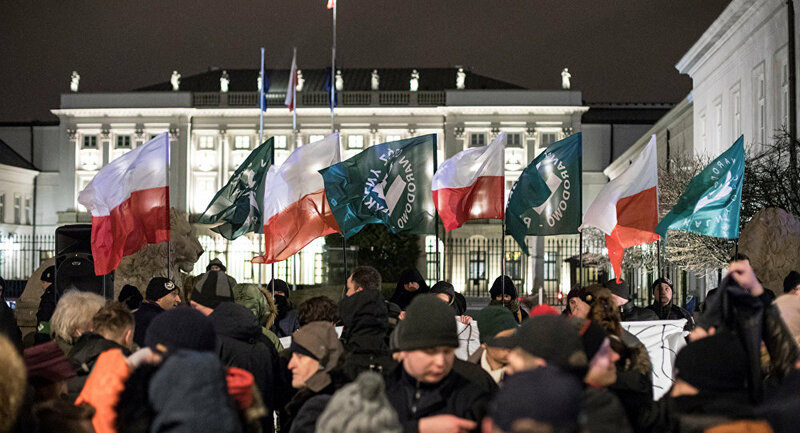 "Each case must be evaluated individually, and no act of wickedness can impose responsibility for all conquered and enslaved nations," says the statement, issued by the Polish government. — Mateusz Morawiecki (@MorawieckiM) 18 февраля 2018 г.
Israeli historians say it's part of an ongoing campaign to blur the lines between the murderers and the victims of the Holocaust. Earlier, Israeli Prime Minister Benjamin Netanyahu in a telephone conversation with his Polish counterpart Mateusz Moravetski, said that his words about the involvement of certain representatives of the Jewish people in the Holocaust were unacceptable. Prime Minister Benjamin Netanyahu spoke today by telephone with Polish Prime Minister Mateusz Morawiecki. He told him that the remarks that were made were unacceptable and that there was no basis for comparing the actions of Poles during the Holocaust to those of Jews. — PM of Israel (@IsraeliPM) 18 февраля 2018 г.
Netanyahu pointed out to Morawiecki that the goal of the Holocaust was to destroy the Jewish people and that all Jews had been sentenced to death. Netanyahu, who is attending the conference in Germany, called Morawiecki's statement "outrageous" and lacking "sensitivity to the tragedy of our people." The so-called Polish Holocaust bill, that criminalizes attempts to link Poland with Nazi crimes, was criticized even at the stage of discussion by a number of states, in particular, Israel, Ukraine and the United States. Israel believes that the law distorts the historical truth, and has demanded that it be reviewed.